Innovative types of interior design involve the use of the most modern finishing materials. 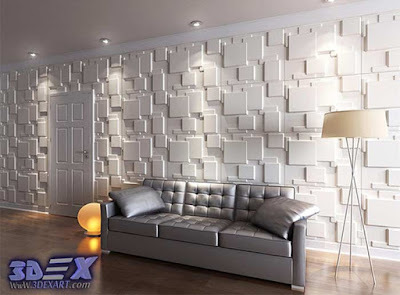 3d wall panels - an unusual and very effective look. Do you want to know more about it? Modern 3d wall panels, largely due to the versatility and use in their manufacture of a rich variety of types, structures and all sorts of 3d effects, took a worthy place in the field of repair of interiors and covering the wall. With 3D panels for walls, you can give any interior volume and in a short time completely change the style of the room. What 3d wall panels are? How and from what 3d panels are made? 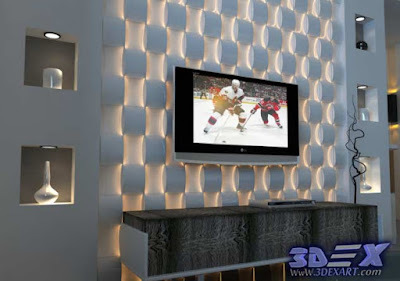 What advantages of 3d panels for walls? Of course, how to install 3D wall panels by their own hands? 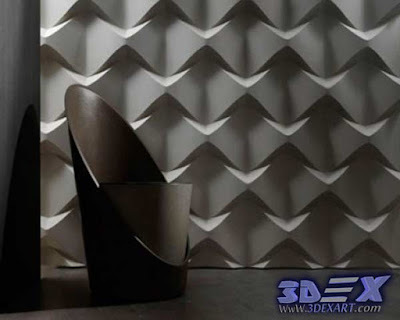 The 3d wall panels are becoming increasingly popular with the decorative decoration of walls in the interior. 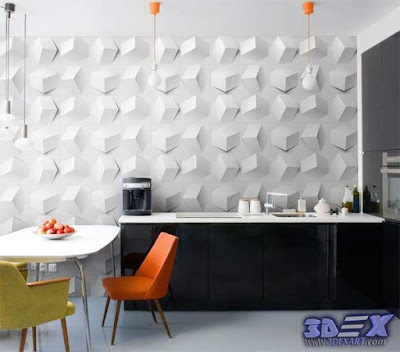 Due to its versatility, a huge selection of 3d wall textures, patterns and color solutions, Modern 3d panels for the wall will harmoniously fit into the interior of any style and design. Let's look at how best to use bulky 3d panels to visually change the boundaries of the perception of space, create a sense of spaciousness, volume and the illusion of walls. 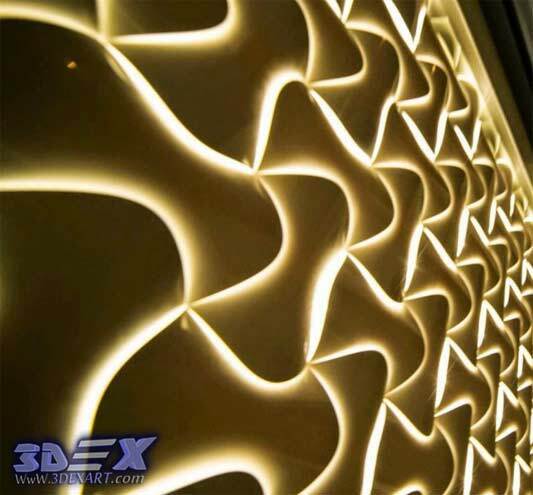 The possibilities of 3d decorative wall panels are almost unlimited. Practical and versatile, 3d panels can create in the interior a three-dimensional image of any complexity with original and unusual visual 3d effects. Both standard and exclusive panels from renowned designers will help to realize any creative idea and make a unique interior. 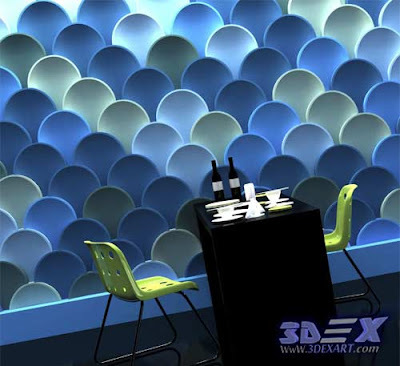 Modern 3d panels are a cover that can be mounted on a wall, furniture, doors, columns, etc. It is great for zoning rooms because due to their unique color solution, these panels visually produce a three-dimensional effect. As a result, your room will look quite different than using modern 3d wall coverings. Wall panels in 3d format have the same advantages as conventional panels made of MDF, plastic or other materials. The technology for finishing rooms with 3D decorative wall panels appeared several years ago, but only recently this method of interior design has gained popularity and reached incredible development in the USA and all over the world. 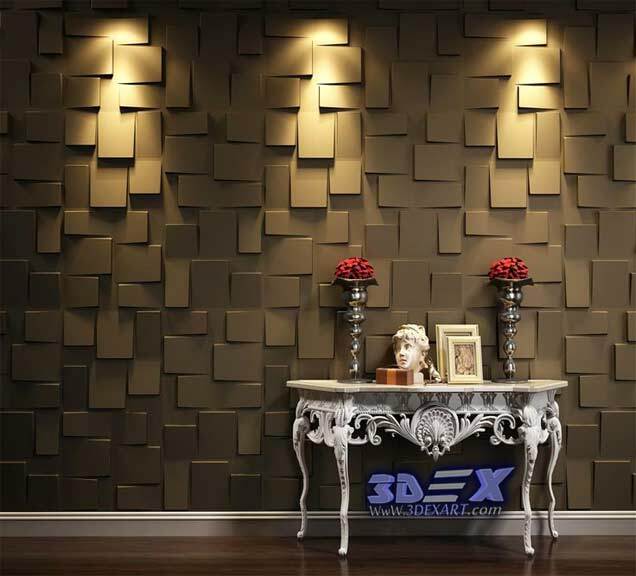 Now you can buy 3d wall panels and decorate the surface in the form of natural stone, ornate silvery patterns, wood carvings and many others. 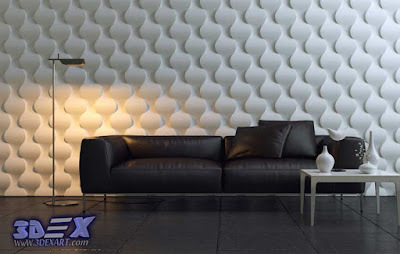 Practical: the care of 3d wall panels is easy. 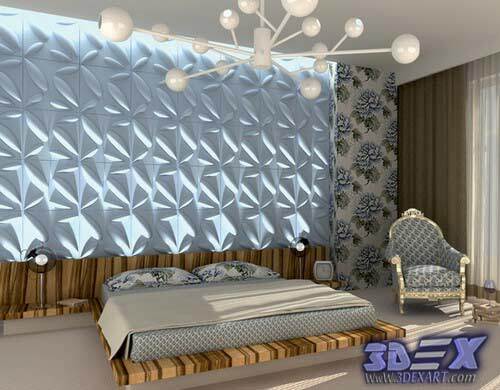 Exclusivity and unusual design: decorating your apartment with three-dimensional panels, you are unlikely to see the same with your friends or neighbors. The choice of design for this material is very wide, and the specialists of the manufacturer always will be happy to help you choose exactly the kind of three D wall panels that will perfectly fit into the interior of your home and also it will be affordable for you. Of the minuses of the art 3d wall panels, we note only the cost, which largely depends on the material of their manufacture. An important property of 3D panels for the wall is that it is usually made of environmentally friendly materials "Eco-Friendly" that do not release hazardous substances. Therefore, this method of wall finishing is safe for any premises. 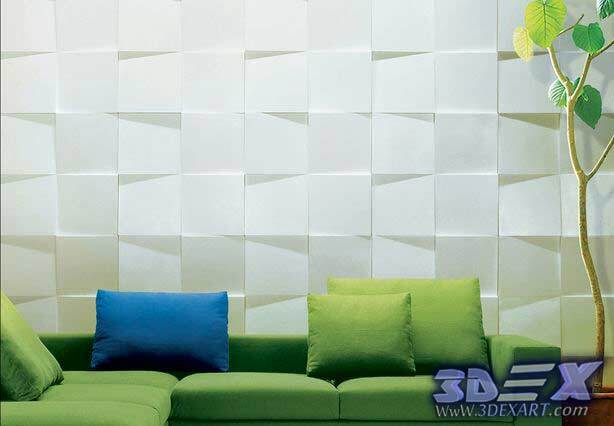 If you want to make the interior original and stylish, then buy 3D panels for walls - this is exactly what you need. This option will allow you to choose exactly the 3d wall texture that fits for a particular room and add some flavor to its decor. Modern 3d panels are rooted in antiquity. In due time they were developed, relying on the idea of ancient wall bas-reliefs carved in natural stone. In general, this is a kind of volumetric tiles made for the convenience of mounting in the form of quick-mounted panels. Modern technologies, unlike the ancient ones, allow to make this material in unlimited versions - using all kinds of materials and technologies for drawings on It, manufacturers create truly real masterpieces. Before falling into the hands of consumers, 3d panels for the walls pass a rather complex manufacturing process. Development of a design project with the construction of a computer 3d model. Making the panels themselves from the selected material. At this stage, the panels are formed and a three-dimensional structure developed on the computer is applied to its surface. Decorative finish 3d panels, which provides for its coloring, enameling or veneering, if it is a tree and applying a protective coating that allows you to serve 3d panels for a long time. Despite the seeming simplicity, the whole cycle of manufacturing this finishing material is quite a complicated process and takes a lot of time, which affects its cost. What are the three-dimensional wall panels made of? Suitable for almost all materials from which you can form a panel. 3D wood Panels made of natural wood look expensive - and, in fact, it is so. 3d wall panels made of wood are good for their natural beauty, which is not replaced by any artificial material. 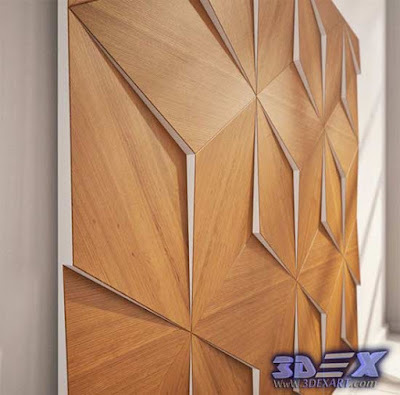 wood is one of the most expensive types of bulky 3d wood panels. Their main drawback is the softness of the tree itself - as a rule, such panels do not provide for face protection against damage. The maximum that producers go to is for easy protection, which is designed to protect the drawing from abrasion and fading. To extend the life of 3d wooden panels, it is recommended to periodically rub with wax or special impregnations. 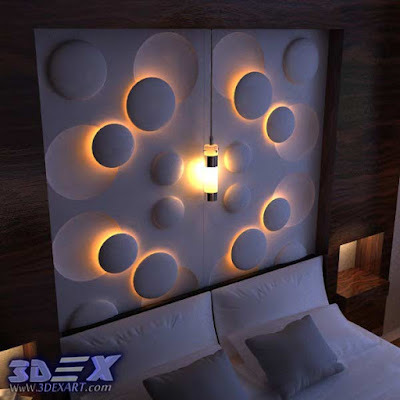 3D wooden panels are great for the improvement of a bedroom, living room or hallway. This noble material will easily become an excellent addition to almost any style, whether it's antique style or the style of Provence. There is one small disadvantage - this material is afraid of moisture, so 3D wooden panels are not desirable to use for decorating kitchen and bathroom. 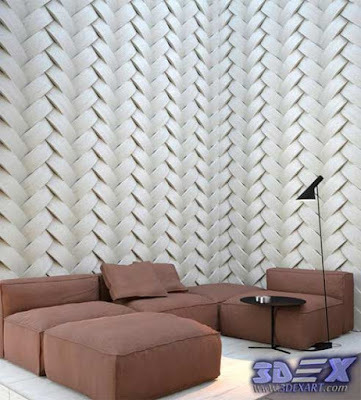 Much more democratic are the 3d MDF panels for wall, which are durable and also perfectly imitate different surfaces. It can be glossy or matte and have any coloring. 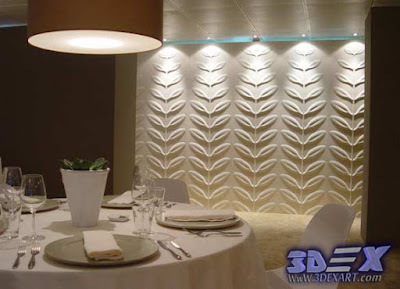 3D MDF wall panels - one of the expensive panels that are produced by the method of hot pressing of small wood chips. For the production of each new series of panels, a special mold is created, which in itself is worth considerable money. Thanks to MDF protective films, ECO 3D MDF panels serve for a long time and are practically not subject to damage. But it does not withstand moisture. Decorative aluminum is one of the most fashionable materials today. The panels made of it look exquisite and rich and at the same time easy. 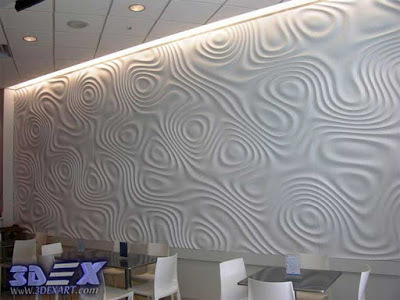 Aluminum is the most common material used to make decorative 3d wall panels. Aluminum volumetric panels are not susceptible to corrosion, do not burn and are antistatic (almost not smeared). Such 3d panels can be safely used in rooms with high humidity. 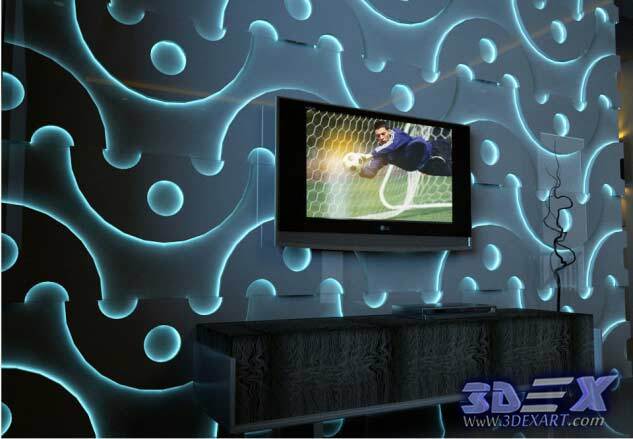 Decorative 3d panels made of aluminum, are very durable. Volumetric drawings, shapes, and patterns on their surface are achieved by perforation. Most often, the surface of aluminum panels is covered with a heavy-duty polymer film, which allows you to choose the right model for almost any style. If you choose 3D panels for the bathroom, then the best material than aluminum is not found, because of Thanks to a special treatment, it has an anti-corrosion effect. In addition, 3D panels of this material are resistant to fire, which, accordingly, allows you to mount them in the kitchen area or near the fireplace. Which is better known by the name "PVC plastic". Modern 3d plastic panels have all the advantages of aluminum panels, but unlike it, It is not very durable and can easily be damaged by careless handling. The plastic panels are less durable, but with the careful care, It will last you long enough. 3d PVC Plastic panels, covered with special PVC film, does not burn out in the sun so that your 3d wall panels will look like new even after ten years. Among the main advantages of decorative 3D PVC panels for walls can be highlighted extreme compactness, ease of installation, as well as low cost. 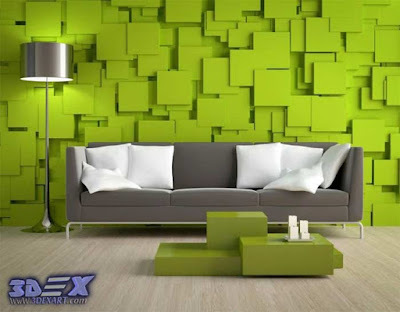 The 3D PVC wall panels of this material are suitable for interior style, It can be used in any room. 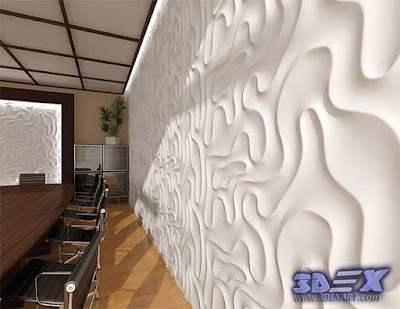 3D gypsum wall panels have their own advantages, including absolute incombustibility, low weight, and unique acoustic properties. 3d gypsum panel is also a fairly common type of material used to make this decorative finish. 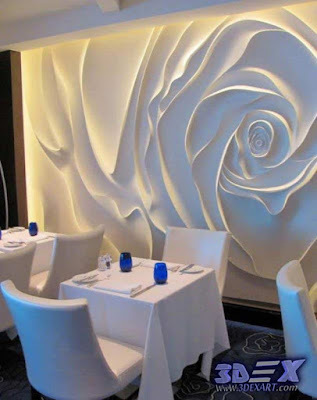 Popularity is defined by its properties - 3d gypsum panels can be used in any interior, including in wet areas. Do not forget about such an interesting eco-material for the wall paneling, like bamboo. If the style of your interior allows, you can use it as a primary accent or extra touches. 3d wall panels made of bamboo are very easy to mount, which makes it possible to install them yourself. 3D panels made of bamboo are a real chic design art. This material is very light, which allows you to reproduce absolutely any shape and pattern. Simple in terms of installation, these decorative elements will be the original complement of the interior in the oriental style, the style of Provence, Chateau, minimalism, etc. 3D Bamboo panels look great both as a wall decoration and as an independent element or in the form of a partition. To determine the choice of 3d panels among its huge diversity, you need to navigate by certain criteria. The first condition is the functionality of the room, where a three-dimensional facing is assumed. Living rooms, especially bedrooms and nurseries, it is better to trim with environmentally friendly materials with a pleasant textured surface - bamboo and wood. The cabinet and the living room will be decorated with plaster and MDF elements, and for the kitchen, dining room and bathroom, polymers with a water repellent effect are preferable. 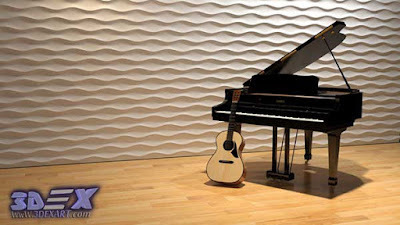 It should be borne in mind that 3D gypsum panels of other types with slotted resonators in the volume folds improve acoustics, so for home music lounges or small club rooms, such types of 3d elements are particularly relevant. In the halls and bathrooms, it is better to install washable versions with a film coating, which withstand increased pollution and humidity. From the perspective of price criteria, MDF panels, the most expensive - bamboo and wooden panels, especially with figured carving, are considered to be the most affordable ones. Especially spectacular and impressive three-dimensional compositions from 3d decorative panels look in spacious rooms with a minimum of furniture. 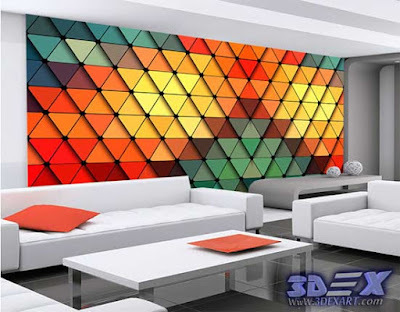 In such rooms, 3d panels can completely cover the wall area from floor to ceiling. But even in large rooms, it is important to choose the correct pattern of panels depending on the lighting and the desired visual effect. 3D panels on the wall are installed, as a rule, on the crate, which naturally hides the useful space of the room and makes it smaller. For small rooms, this is critical. Selecting the art 3d wall panels with a horizontal pattern, you will make the room visually wider and elongated. If the pattern is vertical, you will visually lift the ceiling. Vertical patterns are also recommended for small rooms. For those who want only to slightly adjust the atmosphere with small strokes, you can recommend 3d bench panels. Compactness and small size allow to use it in small rooms, as well as to focus on a certain area, decorating a separate part of the wall. Quite often, 3d bench panels are used as background coverage of a wall behind a plasma screen, home cinema, furniture. In addition, very decorative will look decorative panels with LED Lighting. 3D panels are tiles with a textured image. you can visually enlarge the room and focus on certain areas in the room. Before installing the 3D panels, there is no need to carry out preparatory work. The only thing that is required of you is to choose the place where they will be installed, and also to prepare the walls. Ideally, the wall surface should be flat and smooth, but it's okay if it has small defects, just in this case the panels will have to be installed on a metal crate. Most importantly, in the process of assembling the tiles, the relief applied to the individual parts formed a single pattern. For this, it is recommended to stack them on a horizontal level surface before installing the panels to the wall. If the 3d panels installation will be carried out independently, it is better to choose a variety of panels, in which there are special fixing grooves, since in this case, the joints of different elements will fit very tightly. If the wall is perfectly flat, then it is better to fasten the panels with glue. 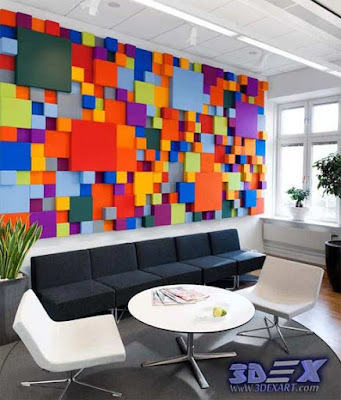 In addition to walls, 3D panels can be applied to the surface of furniture or partitions. 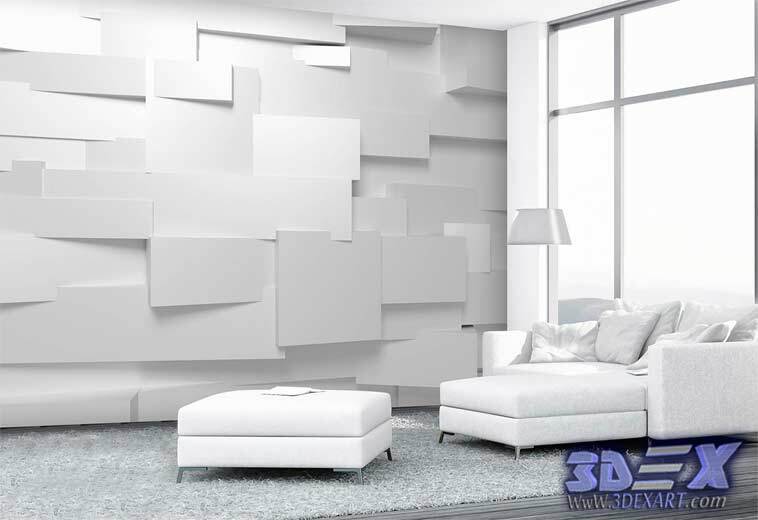 3D panels for walls is a great opportunity to change the appearance of the interior without wasting a lot of time and money. Depending on the peculiarities of the style of the room, these decorative elements can be artificially aged, painted in the right color or created individually, with an exclusive design, which will undoubtedly make your house fashionable, stylish and, most importantly and cozy.